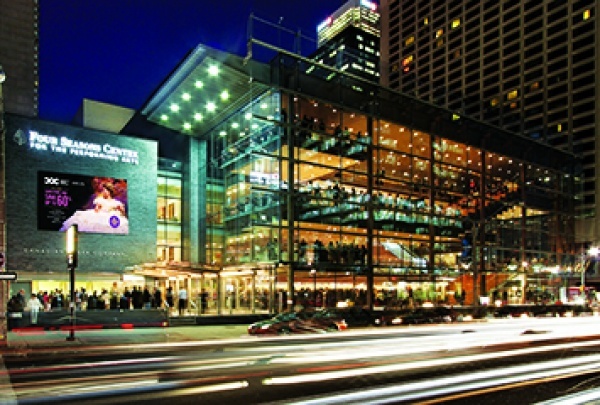 The Four Seasons Centre for the Performing Arts is located at 145 Queen St. W. on a full city block bordered by University Avenue, Queen, Richmond and York streets. The main entrance is at the southeast corner of Queen and University. There is direct stair and elevator access into the building via the southeast exit of Osgoode Subway Station. From Union Station, walk ten minutes north along Bay St. to Queen St., and west along Queen St. to University Ave., or take the subway from Union Station to Osgoode Station. Visit GoTransit.com for more information. 2. Exit at York Street and proceed north to Richmond Street W.
There is a cash-only 24-hour parking lot underneath the theatre ($22 for the day or the evening). It is open to all, including people who are not attending performances, and can only accommodate approximately 200 vehicles, so there is a possibility the lot will be full regardless of your arrival time. The parking entrance is on York Street, south of Queen Street. There is a direct entrance to the centre from the parking garage. Hilton Toronto is situated on 145 Richmond St. W., immediately adjacent to the Four Seasons Centre. 10% off of best available rates. Rooms are based on availability. Offer valid Oct. 2017 through Jan. 2018. Nota Bene serves a modern, seasonal and globally-influenced cuisine, using the best local and Canadian products, steps away from the Four Seasons Centre. Shen Yun ticket-holders: Seasonal Prix Fixe menu, $38 for three courses. The Drake Hotel’s first standalone restaurant in Toronto’s Financial District. Inspired by a modern take on the historic brasserie, offering a sophisticated interpretation of comfort classics. Shen Yun ticket-holders: 15% off all food. Serving fresh and flavourful global comfort food and Lao-Thai specialties since 1978. Enjoy them in their cozy and timeless café or in the summer on their garden patio. Save room for dessert! Shen Yun ticket-holders: 10% off food.